By Nest Architectural Design, Inc. In a neighborhood of quirky architectural diversity, the Blue Truck Studio re-mastered a decrepit bungalow into a tightly-detailed modern tower that subtly references elements of the local vernacular. The classic bay windows and siding of neighboring Victorians were re-interpreted as a floor-to-ceiling front window and square-grooved vertical siding. 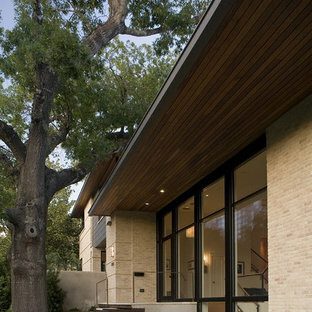 The street level façade of nearby stucco houses was re-invented with a rough-sawn cedar siding hand-coopered to curve up under the soffit. Venting panels disguised in the siding recreate the movement of traditional shutters. Even Bernal Park itself rematerializes as the wind-seeded green roof and the green walls of jasmine in the rear yard. 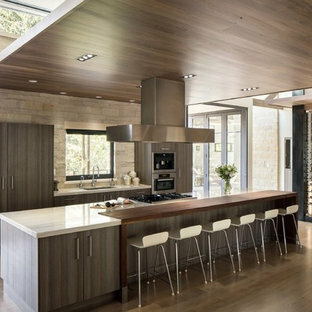 The interior, however, is completely singular: muted hues, raw fir posts and black walnut floors are punctuated by a two-story chimney of light and a bathroom that cantilevers 10’ off the back of the house. Image by Eduardo Navarro Photography. By Hart Associates Architects, Inc.
2013 NARI CAPITAL COTY, GRAND AWARD WINNER, RESIDENTIAL KTICHEN $80,001 -$120,000 This Old Town Alexandria home was ready for a major kitchen renovation. After 20 years of putting up with the dark, short cabinets and a dysfunctional traffic pattern and layout, the owners were ready to roll up their sleeves and throw this kitchen out the window. Design challenges include a peninsula that was too big for the space, appliance locations that were all over, a stackable washer and dryer in the middle of the kitchen and a lack of storage. The first step toward a remodeling solution was to move the washer and dryer to a new lower level laundry area. 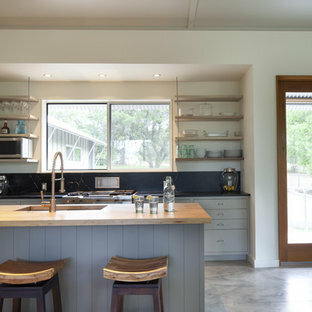 That created space for a new built-in refrigerator, microwave/oven cabinet, pantry and angular end cabinets. 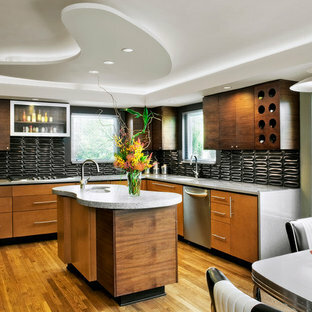 This move also created more room on the walls of kitchen for added cabinetry and countertops. 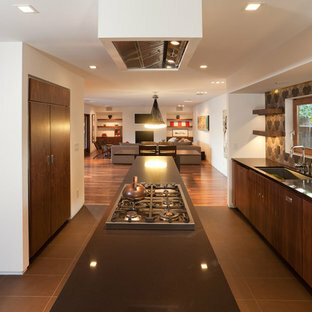 The cook top was moved to one of the walls with a custom wood hood over it. Having removed the old bulkheads, there was space for taller cabinets and some glass front cabinetry (with inside lights) to display china. Large crown molding, along with big arched valances, legs and corbels made this brushed stoke custom cabinetry really stand out. A big knee wall and a middle post made the breakfast room too closed in and separated from adjacent family room. By installing a couple of structural beams, the space was opened up and dressed up with a large arch opening to replicate the front hall columns. Similarly, the front door separating the front hall to the kitchen was taken off, widened and then had the same panel arch treatment done. Now all the doorways in the home have a very classy, yet sophisticated detailed molding. A previously wasted corner area is now home to a custom hutch cabinet. 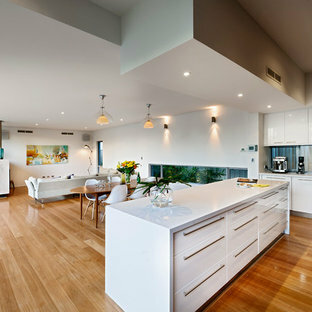 The middle island, not only improved the traffic flow, but also dressed up this kitchen with its furniture look. The expansion of hardwood flooring, from the front hall into the kitchen and beyond, created a seamless transition to the entire first floor. Use of this highly custom brushed stroke glazed cabinetry in a soft vanilla tone complemented the uniqueness of a slab of granite. The light color tumbled marble backsplash made the glazing of this cabinetry stand out. The transformation of this kitchen was so incredible that no one believes the before photos. Narrow Passive House by One SEED (www.oneseed.ca) The aesthetic is a purity of form. It expresses the concept of dwelling as a juxtaposition of shelter from the elements and warmth of home. 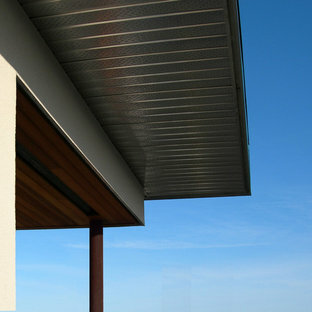 The tough and durable exterior materials, including the off-white fibre-cement panels and the charcoal coloured horizontal ribbed cladding, have a cooling and calming effect. 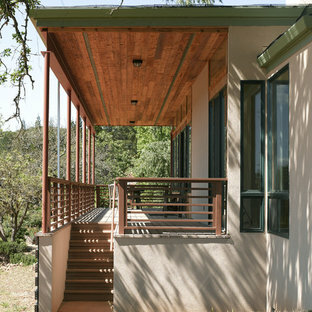 In contrast, warm vertical bands of clear stained cedar accent the front and rear elevations at the fenestration and doors as an inviting allusion to the family inside. The simple form includes two rectilinear masses, a larger one for bedrooms and living, and a smaller one containing service elements such as the stairs, washrooms, and mechanical rooms. 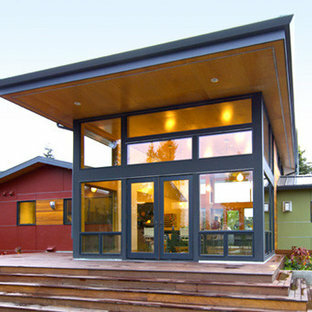 The smaller mass is stepped back from the front and back elevations of the house to provide a sense of entrance. In addition, this allows the larger mass, which is located to the south, to have corner windows with improved views to the north-west mountains. The smaller volume is also the environmental heart of the home with a south facing glazed elevation above the green roof and full-height CMU block walls which feed the passive heating and cooling system within the house.